By 1982, Conrail “patch” units were becoming a rare species. Conrail was finally on top of their motive power woes, and new units coming online meant there was time for attention, including a paint job, for older units. Still, at the time a few locomotives remained in PC black, with “CR” initials applied. 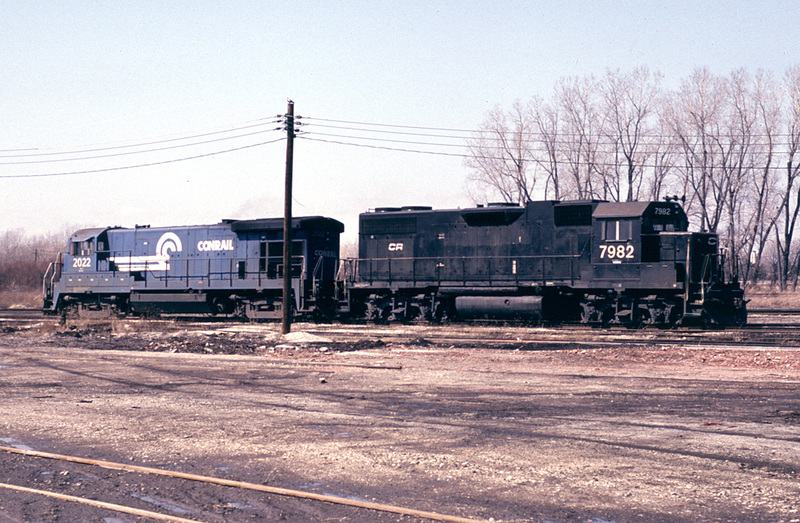 Here we see CR 7892 and 2022 resting at Air Line Junction Yard in Toledo, Ohio on 28 March 1982. CR 7892 is an EMD GP38, built new for the Penn Central in February 1971. It was eventually painted blue and remained with Conrail until the end of the company in 1999, becoming CSXT 1977. Since then it has been sold onward to various leasing companies. CR 2022 is a GE B23-7, built in September 1979. It didn’t fare as well as 7892…2022 was retired in June 1997 and later scrapped at Altoona, PA.